One thing in knitting that I’ve never quite understood is blocking. I understand wanting to make the stitches even and the garment look as good as possible. It’s not that part. I want to know how you actually do it. I have read plenty of articles detailing how to block this or that. They run the gamut from lightly spray with a water bottle to fully immerse your knitting in a tepid bath with a little bit of cheap shampoo. Which is correct? Does it change according to the type of wool/material your knit product is made out of? Does it change according to what the garment is? Do you have to block everything? So, last night, after a botched attempt at Semifreddo, I decided to give this blocking thing a go. Remember that herringbone cowl I was working on? I got bored. About halfway through the project, realizing I never wanted to do another herringbone stitch again, I cast the piece off. Because I knew I couldn’t ruin it at this point, I decided to try blocking it. I used the immersion technique. I filled a bowl with tepid water and a tablespoon of my banana-smelling shampoo (fitting, considering the color). I let it soak for about fifteen minutes and then gently pressed the water out. I adjusted the stitches and laid it flat on a towel on a pillow. It’s currently in our living room, trying to dry out. Another thing I don’t get yet is swatching. I understand it helps with the measurements and all (math, yeck), but do you really have to knit a 4×4 inch square? Can you reduce it? I have this handy swatch calculator on my iPhone that lets me break it down to inch by inch. Can’t I just knit a couple of inches and compare that way? I don’t know. Something tells me this is one I just have to give up and do. Especially after the first two failed attempts at my brother’s hat. I’ve also decided I need to try toe up socks. Cuff down, easy(ish)! I figured out how to do the magic cast-on. That was simple and oh-so quick to figure out. It’s everything else I’m struggling with now. I’ve frogged the sock I’m working on about four times now. I’m almost at the point where I’ll have to throw out some yarn, it’s been frogged so much. 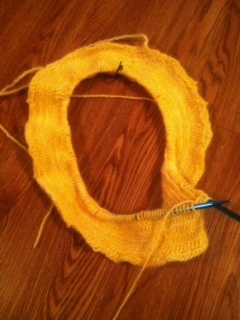 I did manage to start and complete a cowl a couple of days ago, though. I pulled out my jumbo size 17 needles and cast on 90 stitches (really arbitrary number; I just wanted something long and even). Four Doctor Who episodes later, I cast off and stitched the piece together. It’s all seed stitch, so it didn’t take much concentration, which was nice for a change after all the failed projects this week (and not just in knitting). I’ve received plenty of compliments on it, and a friend of mine keeps threatening to nick it. I may just have to make her her own. That’s my week of knitting misadventures. I’m hoping this evening (Friday, W00T!) and the weekend will bring some crafting success.